Saysame – is about my on-going journey and search for truth and love, and my desire to live life as an expression of who I really am and not who I, or others, think I should be. What I’ve experienced and come to know as my truth has put me outside the box and 180 degrees out of phase with present society programs and beliefs. Saysame (My Blog) journals my personal experiences and insights from a different (non-denial) point of view. My intent is to not only enable others to see and feel my experiences and inter-actions with others, but also see how my personal awareness and empowerment has changed the way I look and respond to different situations. 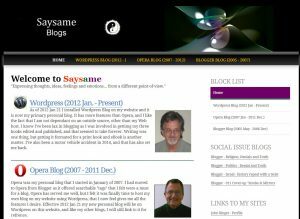 I’m still a work in progress, so you will also be aware of what I am struggling with..
Saysame was on Opera (2007 Jan – 2011 Dec) but it closed down in 2011, so all my posts, (minus the images) were transferred to WordPress.